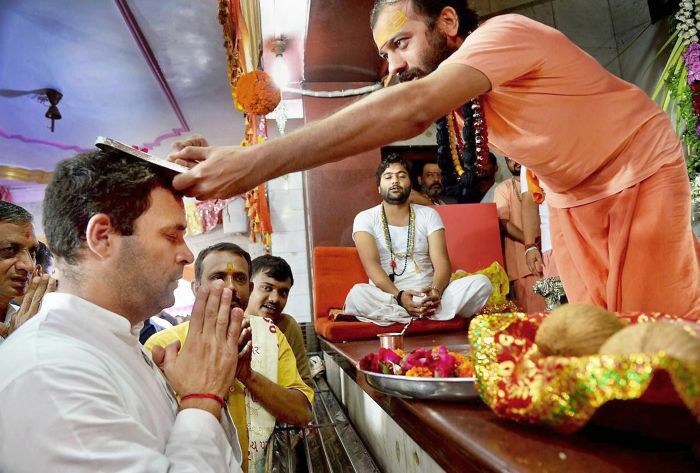 Rediff.com » News » What will Rahul do if Congress loses Gujarat? 'The Modi-Amit A Shah duo will hold on to the state for the BJP,' predicts Sudhir Bisht. The Bharatiya Janata Party has ruled Gujarat for over 19 years now, since March 4, 1998. The BJP won the 10th, 11th, 12th and 13th assembly elections on the trot. The dates for the 14th assembly election are yet to be announced, but there is tremendous value being attached to the election. Political pundits make it appear that the election is some kind of referendum for the Narendra D Modi government. I believe that there is much more at stake for Rahul Gandhi than Modi in the Gujarat election. I will not blame the political analysts for their obsession with Modi in all elections. Even BJP sympathiser Ratan Sharda, who may not hold a position in the government or in the BJP/RSS, declared on television recently that the BJP has much more at stake in the Gujarat election than the Congress. Since there are a large number of traders and small scale businessmen in Gujarat, Sharda felt the assembly election would be a referendum on the Goods and Services Tax. I believe Sharda, the ERP professional, has committed a faux pas by this utterance. If indeed the Gujarat assembly election is a referendum on GST's acceptance by the trading community, then losing Gujarat would be a mega failure for the BJP. But as I said, the Gujarat election is less about the BJP winning or losing Gujarat. It is about what the Congress does with its bright chances at the Gujarat polls. Any party that has ruled a state for 19 years is supposed to lose an assembly election. Even if one is a Naveen Patnaik, chief minister of Odisha since March 2000, or a Dr Raman Singh who has been the CM of Chhattisgarh since December 2003, or a Shivraj Singh Chauhan who has been Madhya Pradesh CM since November 2005. No doubt, Gujarat is the home state of Narendra Modi, the most powerful leader in recent times, but Modi has ceased to be the man responsible for Gujarat since May 2014. The BJP leaders in Gujarat since Modi went on to manage national politics have been an ineffectual Anandiben Patel and an inconsequential Yangon-born Vijay Rupani. A combination of anti-incumbency and lackadaisical performance by two chief ministers for the past 40 plus months should lead to a change of political order in the state. Even if we factor in the fact that Gujarat happens to be Modi's home state, the state should be an easy win for a serious minded Opposition party. But the Congress-friendly media going gaga about a possible win for the Congress is something I don't quite understand! The BJP, to my mind, should be prepared to lose its stranglehold in Gujarat. The people of Gujarat have given the BJP an opportunity to lead the state for 19 long years. The people of Gujarat have given Modi unstinted support when he was the CM. In 2014, the people of Gujarat gave Modi a 100 percent clean sweep when they voted for the BJP in all 26 Lok Sabha seats. It is obvious that the voters in Gujarat would like to opt for change even if out of sheer boredom, just to ensure that the BJP does not take them for granted and to see how the other national party, the Indian National Congress, performs if it is given an opportunity to lead the state. Is it not true that the children of the deprived try harder to make a mark in life? So from the psychological perspective of the Gujarat electorate, the Congress is supposed to win the assembly election hands down. The Congress should be a party with a hungrier belly. It has not been in power in Gujarat since 1995. So what would be so amazing if the Congress wins Gujarat? It is something that should be expected. In fact, it would be disastrous for the Congress if it is unable to win Gujarat. As per Congress Vice-President Rahul Gandhi, who is leading the Gujarat charge from the front, Modi's GST implementation and demonetisation have been the biggest disasters for the country. And since Gujarat is all about the business sector, winning Gujarat should be a cakewalk for Rahul Gandhi. The general mood of Congressmen too seems to be on the ascendance nowadays. A slew of senior Congressmen, all sons of their illustrious fathers, are seen on television, talking about the magic woven by the Prince of 10 Janpath in the US recently. Twitter is abuzz with Rahul Gandhi followers praising him for the Congress winning an election. They are referring to the Delhi University Students Union polls in September. Many in the Congress attribute this victory to their vice-president's new found passion and zing. Nothing ceases to amaze me about the Congress party that celebrates the ghosts of its resurrection even as their building columns collapse one by one. Only one family surname can lead them, others are objects of ridicule even though there is not one Congress MP today who isn't better equipped to lead the Congress than Rahul Gandhi. Sachin Pilot has a fair degree of education and some kind of mass base in Rajasthan. Jyotiraditya Scindia has more hair on his head and more grey matter beneath the hair than Rahul Gandhi. Even an old timer like Anand Sharma has some combativeness left to snarl and roar from the Rajya Sabha benches. Kamal Nath can still win a Lok Sabha election from Madhya Pradesh and even a Pramod Tiwari has some degree of oratory left to make an impressive impromptu speech. The tentative Ghulam Nabi Azad can still make an unimpressive but complete speech on the internal affairs of the country. All these guys, highly mediocre or gloriously below par in their own way, are titans when compared to the waffling, wobbly Rahul Gandhi. Shashi Tharoor hasn't made my list of people who could easily have usurped Rahul Gandhi's position even though he gained new followers with his anti-British tirade that helps him with an image of being a proud Indian. But Tharoor faces an uncertain future with the ongoing investigation of his wife Sunanda Pushkar's death. With all these men rallying around Rahul Gandhi, what would happen if the Congress loses Gujarat? By the time the Gujarat election results are announced, Rahul Gandhi's well orchestrated ascension to the position of party president would have taken place. He would, in all probability, be elected unopposed to the post although I wish that Jiten Prasada lives up to his reputation of being his father's son and challenges Rahul in the Congress party's presidential election. His father, the late Jitendra Prasada, had challenged Sonia Gandhi in November 2000 for the Congress president's post. In all likelihood, the Congress will fall short in Gujarat. The Modi-Amit A Shah duo will hold on to the state for the BJP. This in itself would need a herculean effort to achieve. So what happens if Rahul Gandhi loses yet again? It would make Digvijaya Singh gloat! He had been the fall guy for being unsuccessful at forming a Congress government in Goa in spite of the Congress being the single largest party in the state. He is currently on a six month sabbatical for a 'Narmada parikrama' -- he will travel down the river for 3,300 kilometres and will be back in April to defend Rahul while the rest of the old guard pleads with Priyanka Gandhi to take greater interest in party affairs.